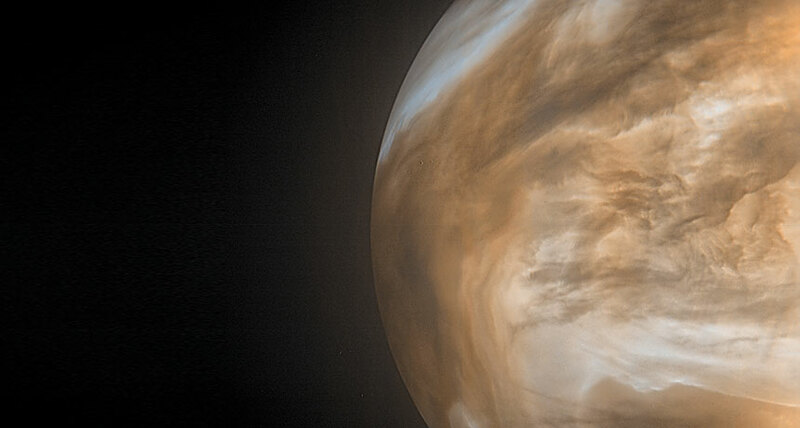 PUSH AND PULL New research has shown that Venus’ thick atmosphere, shown here in an image from the Japanese space agency’s Akatsuki spacecraft, can speed up the planet’s rotation. Time is out of joint on Venus. The planet’s thick air, which spins much faster than the solid globe, may push against the flanks of mountains and change Venus’ rotation rate. Computer simulations show that the thick Venusian atmosphere, whipping around the planet at 100 meters per second, exerts enough push against a mountain on one side and suction on the other side to speed the planet’s rotation rate by about two minutes each Venus day, according to a study in Nature Geoscience June 18. That’s not much, considering that the planet rotates just once every 243 Earth days. By comparison, Venus’ atmosphere rotates about once every four Earth days. Precise measurements of the planet’s rotation rate have varied by about seven minutes, however. The push and pull of the air over the mountains could help explain the mismatch, with some other force — possibly the gravitational influence of the sun — slowing the planet’s spin back down. The simulations by UCLA planetary scientist Thomas Navarro and colleagues are the first to account for a 10,000-kilometer-long wave in Venus’ cloud tops, spotted in 2015 by the Japanese space agency’s Akatsuki spacecraft (SN: 2/18/17, p. 5). Similar waves are launched into the atmosphere on Earth when air flows over a mountain, but they normally dissipate quickly as opposing winds break them up. Venus’ atmosphere rotates so much faster than the planet and in such a uniform direction that the waves could persist for a long time. More detailed measurements of Venus’ rotation, possibly taken with a future lander (SN: 3/3/18, p. 14), could eventually help reveal details of Venus’ interior, such as the size of its core.